This is Landing Page HTML5 template for a business consulting website. It includes an image with logo, a menu bar, smooth scrolling, and gallery. Also contains blocks with a blog and contact information. It's suitable for the business site for a startup company. Also contains a block with a description of the company and a list of services. This template was created using the Novi Builder. This means that you can create a fully-functional HTML5 website without any programming skills. 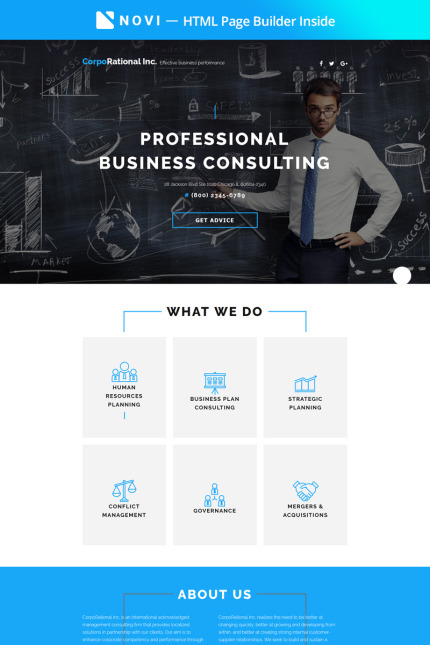 With this template, you'll be available to various options for designing pages for a landing page business consulting sites. It also supports solutions for the development of adaptive websites. The design uses stylish animations and an ideal fully responsive code.